Wrinkles are often considered a nuisance, but it turns out that they can reveal fundamental properties of materials, according to University of Massachusetts Amherst scientists. The researchers have discovered that the thickness and elasticity of a thin film can be calculated by counting and measuring the wrinkles that form when a force is applied to the film. The findings, published in the Aug. 3 issue of the journal Science, shed light on how thin films behave and have implications for understanding the behavior of many materials, from membranes in water purification systems to the artificial skins used in treatment of severe burns. Jiangshui Huang, Megan Juszkiewicz, Narayanan Menon, Wim de Jeu, Todd Emrick and Thomas Russell of UMass Amherst collaborated on the work with scientists from the Institute for Atomic and Molecular Physics in the Netherlands and the Universidad de Santiago in Chile. When scientists consider a material’s inherent properties, basic qualities such as molecular weight, color or elemental composition come to mind. But the physics and chemistry students of tomorrow now have more to consider. 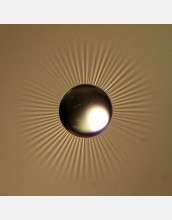 With a simple and elegant experiment, the UMass Amherst team has demonstrated that the size and number of wrinkles that form when a force is applied to a thin film is directly related to the thickness and elasticity of the film, and these qualities can be readily calculated using wrinkle data. To investigate, the researchers led by polymer scientist Thomas Russell and physicist Narayanan Menon floated ultrathin sheets, or films of polystyrene—a polymer typically used in hard plastics— in a Petri dish of water. With each polystyrene film the scientists induced wrinkles, either by adding a drop of water or a solid disc to the center of the film, or poking it with a sharp point. The scientists then counted the number and length of the wrinkles radiating out from the center, and recorded the wrinkling with a digital camera. As the scientists prodded and poked the floating films, which ranged in thickness from 31 to 233 nanometers, they noted several consistencies. When they added water to the droplet at the film’s center, increasing the weight on the film, the wrinkles were longer and there were more of them. When they added the same amount of water to a thicker piece of film, the wrinkles were again longer, but there were fewer than with the thin film. By scaling the relationships they observed between the number of wrinkles, the length of the wrinkles and the thickness and elasticity of the film, the researchers came up with some simple equations for determining a film’s elasticity and thickness by counting and measuring its wrinkles. Because they floated their films on water, their data were free of confounding forces made by the tacks or pins often used in wrinkling experiments to hold the films firmly in place. “As we venture into the age of nanotechnology, it becomes increasingly important to know if the material properties of ultrathin films differ from their properties in bulk,” says Russell. To further test their proposed relationship between wrinkles and elasticity, the team experimented with polystyrene sheets that were modified to various degrees with a plasticizer. The relationship held up and the team was able to calculate each film’s elasticity. With only a low-magnification microscope and a dish of water, the scientists were able to calculate the elasticity of the films with as much precision as the more expensive, equipment-heavy and time-consuming methods that are currently in use. “These experiments give us a simple, inexpensive way to access the properties of such nanoscopically thin films that can be several tens of nanometers thick,” says Menon.